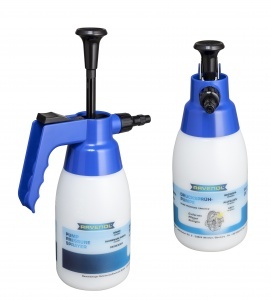 RAVENOL Pressure Sprayer is a high quality plastic pressure sprayer that can be used for a wide range of tasks, including application of brake cleaner and other aggressive chemicals. Simply pressing down the spray button with your thumb is enough to create an even, continuous spray and the fineness of the spray can be regulated by turning the nozzle nut. RAVENOL Pressure Sprayer has a maximum capacity of 0.9 litres and can generate pressures of 3 bar. This creates a fine but powerful spray which reliably and conveniently covers the spray target, including areas which are difficult to reach. The bottle has a capacity indicator printed on it in both litres and pints (ideal for imperial lovers and older mechanics), plus a mark to indicate the maximum recommended fill. Frequently used mix ratios are also marked on the bottle: 1:10 (10%), 1:20 (5%), 1:50 (2%). Before use, check that none of the components are damaged and that they work properly. Unscrew the pump from the container and fill with liquid up to the "max" level marked on the bottle. Screw the pump head back on and securely tighten it so that it is airtight; otherwise pressure cannot be generated. Pump air into the container using the plunger (approx. 20-30 pump actions). The sprayers are equipped with an automatic pressure release valve, meaning it is not possible to generate more pressure than is specified. To begin spraying, push down the spray button, and regulate the spray from a jet to a mist by turning the nozzle. Carefully unscrew the sprayer head so that the pressure can escape slowly. Dispose of the contents in accordance with the manufacturer's instructions; do not simply pour them down the drain. Clean the pump using clean water or spray a suitable cleaning product through it. Never allow the container to remain under pressure for an extended period of time and never expose it to direct sunlight. Do not fill the sprayer with liquids at a temperature of over 30°C and always follow the safety instructions provided by the manufacturer of the liquid (see the product information or the safety data sheet). Replace damaged components (e.g. seals). Do not direct the spray at people or animals! It is difficult to move the pump plunger. Oil the plunger from time to time. It isn't possible to generate pressure. The bottle is not properly closed; air is escaping. Liquid is dripping from the nozzle. There is air in the sprayer. Spray upwards in a diagonal direction for approx. 2-3 seconds. The sprayer doesn't spray although there is pressure. The nozzle and/or the filter at the end of the hose are blocked. Clean the blocked nozzle or blow through with an air gun. Liquids are not sprayed evenly. The liquid is dirty or not properly mixed. Change the contents and clean the bottle or mix the liquid properly by shaking it.